Activate the Translations auto-fill for option and choose the language to use as a source text in the Translation files. 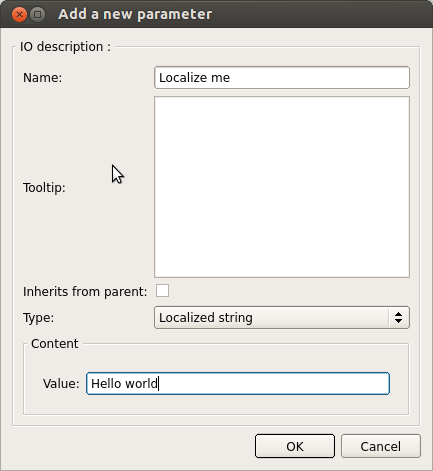 Complete the Project properties for each supported language. Consider adding additional Description languages. new python boxes using localized strings as parameters. For further details see: Localized Parameter. Add a parameter through the box inspector. The name of your localized parameter. This is part of the translation message ID, avoid to modify it, or it will create a new entry in your translations files. You can use it exactly like a String type parameter, the only difference is its value depends of the current robot language. Value The Value will be used as the source text to be translated across all supported language. This will return the source text translation of your parameter in the current language of your robot. If the a translation is not available it will default to the source text of the parameter.